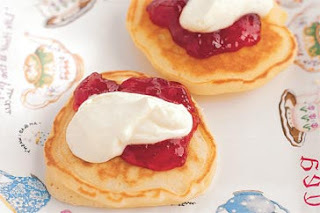 One of my favourite things is my dad's pikelets with strawberry jam and cream. It's a bit of an Australian morning tea treat and my dad makes the best. I have missed these the most this week as he makes them at least once a week and I'm staring at another 43 days without them. On the up side I have lost 1kg already! I can't believe it's only been a week but the scales say it happened so it must be true. To give you an idea of what I am like, my height is 174cm or 5' 9" and I was 71kg or 156.5 pounds. I'm not really doing this to lose weight but I wouldn't mind losing a few kilos in the process to start getting ready for some summer fun! So overall for my first week I don't think I did too badly since I think I was eating a piece of chocolate almost everyday and I consider myself to be more of a savoury person! I will keep on keepin' on and let you know next Sunday how I'm going. Here's hoping you're having a fantastic Sunday!